The wasteland is a dangerous place! Resources are scarce, ulterior motives abound, and deadly enemies greet you at every turn. In Fallout: The Board Game, your actiOns can have dire consequences! Completing quests changes the course of your adventure, and the choices you make during chance encounters can change what the populace thinks of you. Should you assist the Railroad or help the Institute? Will the Brotherhood of Steel prevail over the Enclave? Can you discover the secret of Vault 84? 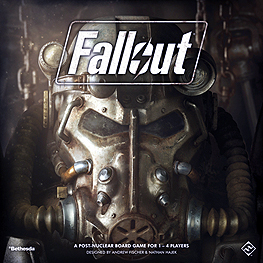 Grab your friends, get S.P.E.C.I.A.L., and win influence over the wasteland with Fallout: The Board Game!